Good Lord that is rank, but a blessing be upon thee. First up the other night was a rare beer, by rare I mean a beer that found its way down the sink. Ale Mary by the RCH Brewery in Somerset. Unfortunately this beer was very disappointing, to the point of even being undrinkable. Whenever I have a beer like this I always give it the benefit of the doubt that perhaps it was just a bad bottle? Anyone who has had a better experience please let me know. It smells and tastes of Sherbet, brown sugar and cloves. It is very sweet, almost sickly oversweet. It reminded me of the Leute Bockbier I poured down the sink because it tasted very similar and was out of date. This beer was far from out of date so that is not an excuse. Perhaps both beers were fine and were as intended and if so, they are not for me. It reminds me of Orange juice that has gone off and starts fermenting itself. Anyway, this was not for me but I am open to the possibility that it was off. Even if it was, it was too sweet for my taste. 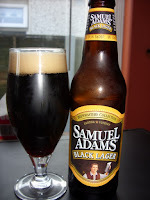 The next day I tried this Dark Lager from Sam Adams. The last dark lager I had was Zeitgeist which started off as not great but I got very used to drinking them and they are all gone, including the one I was sent in replacement to the broken bottle from my initial shipment. Thanks Brewdog. Anyway this is a different style completely. Where as the Zeitgeist is thin and almost watery but very easy to drink, this is thicker and more chewy and not so easy to drink. I found both the aroma and the taste to contain Caramel, Prunes and a little coffee. It was very tasty but I do not think I could drink too many of thgem before I want something lighter. So not a session beer for me but a very nice beer all the same and a God send after the Ale Mary. 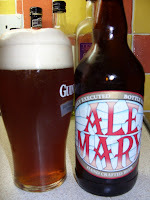 I'm pretty confident that that's what Ale Mary is supposed to taste like, unlikely as it may seem. It's very out of character for RCH: how one brewery can produce this and Old Slug is borderline schizophrenic. I felt much the same about Ale Mary. Overpowering cloves ruined it for me. The Tale Of The Ale: Good Lord that is rank, but a blessing be upon thee.